Onesies for councilors Andrea Campbell and Michelle Wu, who are expecting. 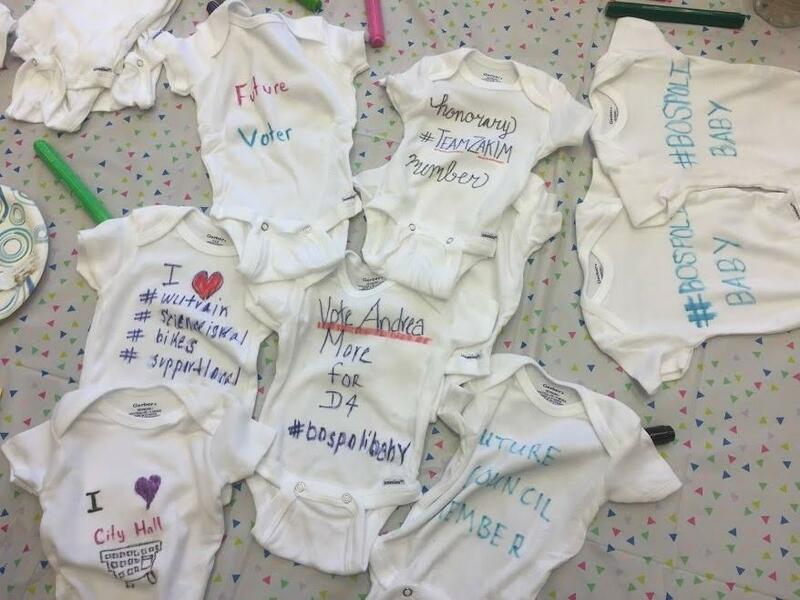 The onesies read “Future Voter,” “Future Council Member,” and “#Bospoli Baby.” On Tuesday, city councilors and their staff feted some of Boston’s newest constituents and their mothers — two city councilors — with a surprise shower. Andrea Campbell, who represents Dorchester and Mattapan, and parts of Roslindale and Jamaica Plain, is set to welcome her first child in August. Michelle Wu, the City Council president, is expecting her second child at the beginning of July — days after the anticipated final vote on the budget. Wu said she had a meeting with her chief of staff scheduled for the time of the shower, but then Councilor Annissa Essaibi-George “stormed into my office and said that she needed to speak with me privately.” When Wu followed her into the Curley Room, she was greeted by the rest of the city councilors and their staff. “I’m lucky to have such wonderful colleagues who have made such a warm family for Blaise,” said Wu, referencing her 2-year-old son. “We’re going to have a very fun summer with two new City Council babies,” Wu said. Maddie Kilgannon can be reached at maddie.kilgannon@globe.com. Follow her on Twitter @MaddieKilgannon.